A hero Gurkha has won the Military Cross after single-handedly fighting off two armed Taliban attacking an Afghan patrol base... with just his ceremonial Kukri knife. Rifleman Tuljung Gurung tackled the gun-wielding insurgents armed only with his razor-sharp traditional Nepalese blade and forced them to flee. Incredibly, the soldier - now an acting Lance Corporal - battled them despite being dazed after a bullet smashed directly into his helmet and he was knocked down by shockwaves from an enemy hand grenade which he threw to safety when it landed next to him. Now the modest 28-year-old has won the third highest gallantry award for his courage in Afghanistan. Acting L/Cpl Gurung received the Military Cross for stopping the extremists from reaching sleeping British soldiers in the Helmand compound. Top brass said his selfless bravery had prevented a ‘potentially catastrophic loss of life’. He is among 117 servicemen and women who received awards in the operational honours list, published today. Most of the honours go to troops who served with 4 Mechanized Brigade in Helmand between October last year and April. 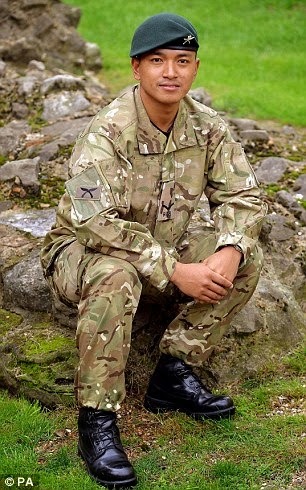 Acting L/Cpl Gurung, who serves with the Royal Gurkha Rifles, was on duty at Patrol Base Sparta, in Nahr-e Seraj, at 4am on March 22 when he spotted two Afghans running towards his sangar, or watchtower.